Robbie was up again this week as I wanted to try the Leuthen scenario again, incorporating a couple of minor rule amendments relating to artillery, i.e. guns were not eligible to do passing/traversing fire and manhandled heavy guns couldn't fire in the turn they moved. 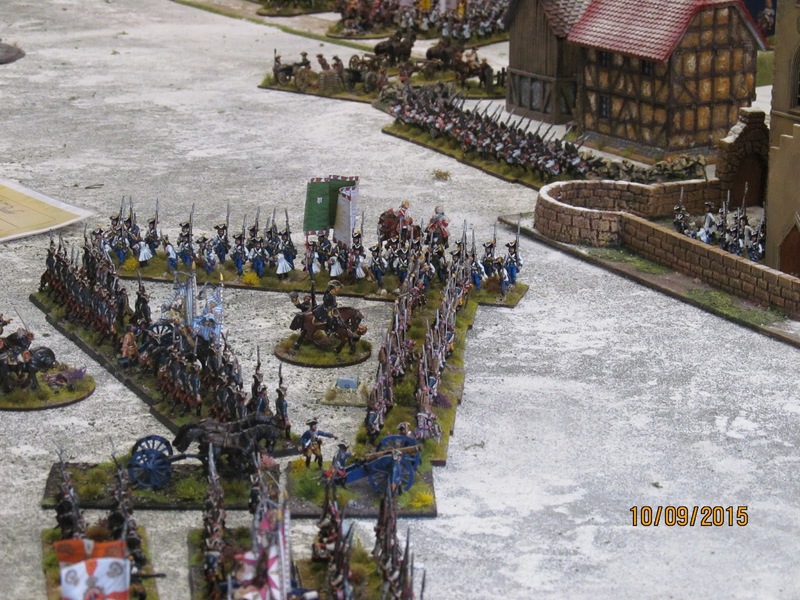 The set up was exactly the same as last week with Robbie taking the Austrians and me the Prussians. 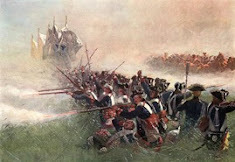 The main Prussian force started to enter the battlefield, but too slowly for my liking, especially the artillery. More Prussian cavalry appeared on my right and opposite them Sebelloni's and O'Donnell's brigades of cuirassiers and dragoons deployed on the Austrian base line. The above was the result of throwing in my first melee against the Austrian cuirassiers on my right. Two hits out of nine, and the trend continued throughout the game! Turn 1 saw my advance guard in the centre fail to move. On the right, Zeithen's cuirassiers saw an opportunity to catch the withdrawing and already weakened Reichsarmee troops on the hop and attempted to charge. 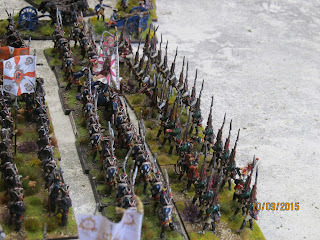 One unit of cuirassier was beaten back but a second charged home and drove their opponents back, but failed to break them. I tried this again with similarly disappointing results. If the target unit had broken the Reichsarmee units were so brittle that the whole brigade would in all likelihood have broken.....but it didn't happen! 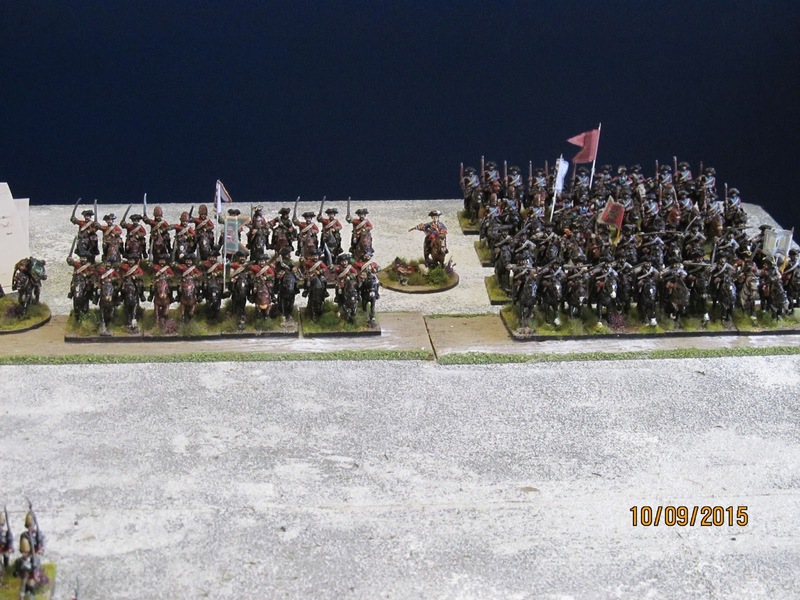 Austrian cavalry massing on my right. 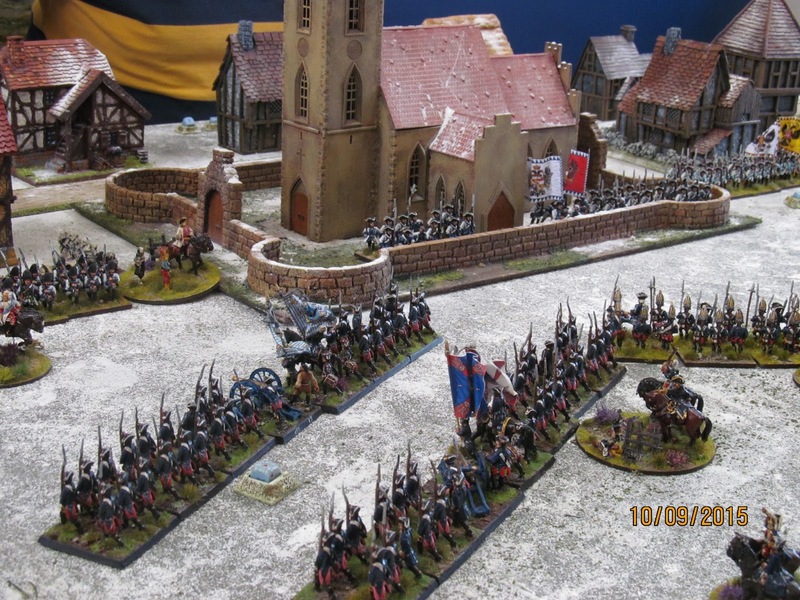 Robbie managed a blunder when ordering his Reichsarmee grenadiers cover his withdrawal. Instead they charged the Prussian line, survived the closing fire and were locked in melee for several turns, and in doing so slowed my infantry advance on the right centre significantly. They were broken eventually bit the damage had been done. 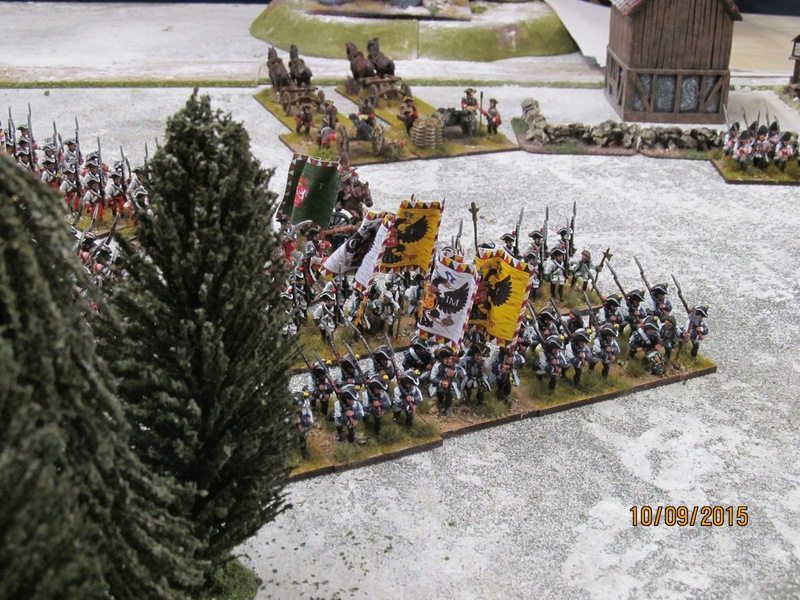 An Austrian battalion caught my grenadiers in the flank. Being grenadiers and stuff this didn't bother them too much and they held on for a couple of turns until the battalion of Prussian Guard behind them slammed into the Austrians, breaking them. 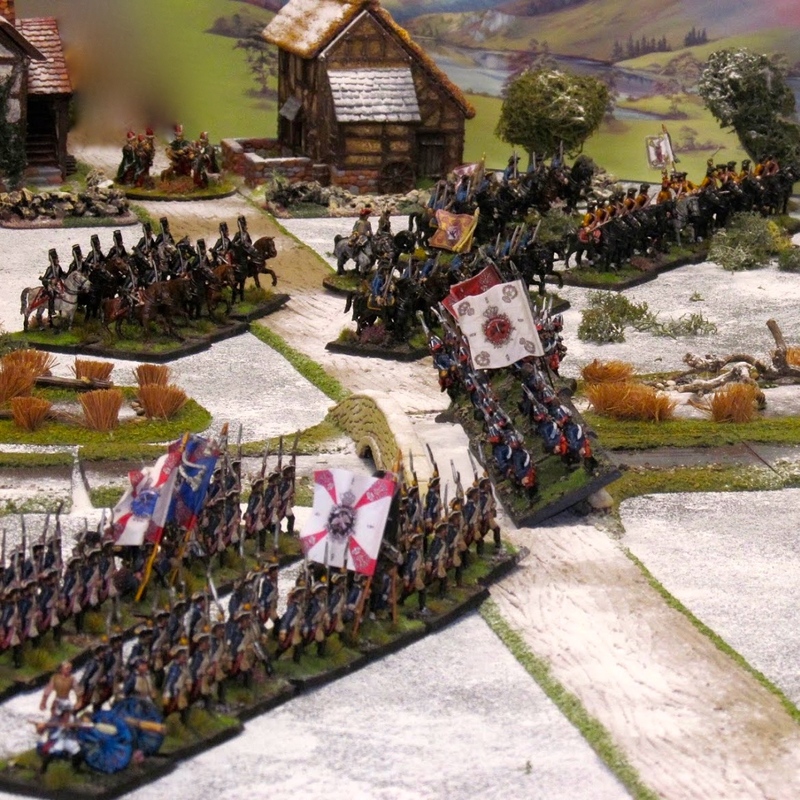 Prussian and Austrian cavalry clash on the right flank. 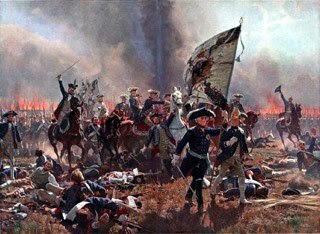 The Austrians got the upper hand in all the combats and the Prussian cuirassier brigade was shaken and forced to retreat a spent force. Solid (if somewhat battered) lines of Reichsarmee troops in front of Leuthen. The Austrian reinforcements arrived all at once and earlier than I had hoped on my left. The centre and right of the battlefield from the Prussian side, with my cavalry uncharacteristically struggling to hold the Austrians back. 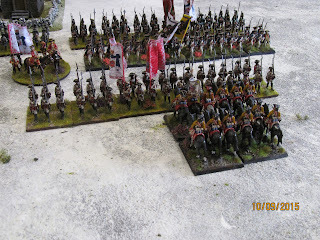 The Austrian cavalry on my left. 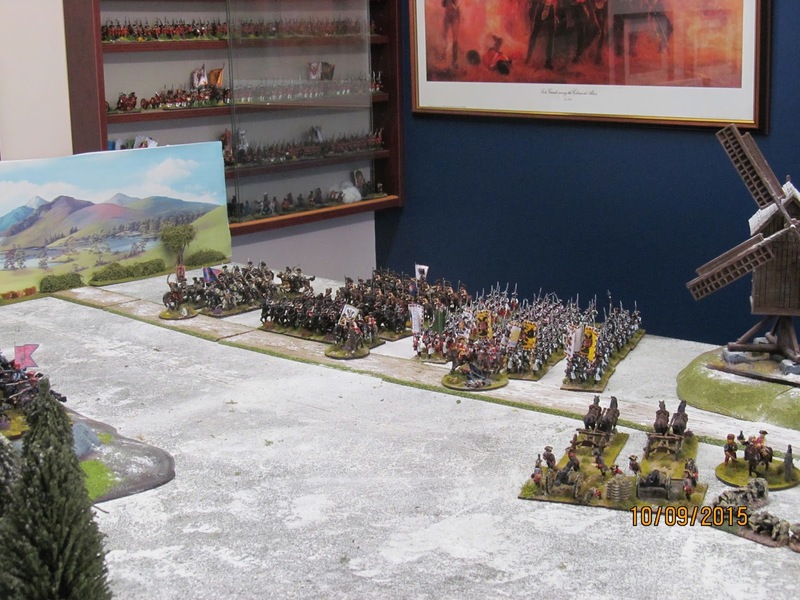 The two units seen in column managed a blunder and were forced to advance. They were unable to deploy into line so were hit by my cuirassiers. Both units were forced to withdraw shaken. Meanwhile my hussars face five squadrons of Austrian cavalry. Fetch the brown trousers! Robbie tried to punch through my centre with four battalions of infantry. 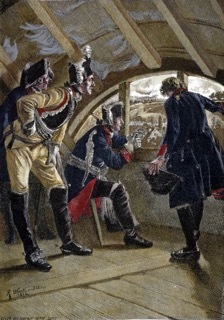 The first was destroyed by a combination of musketry and artillery fire and the second was halted. The Prussians in the centre poised ready to assault the churchyard and the village. 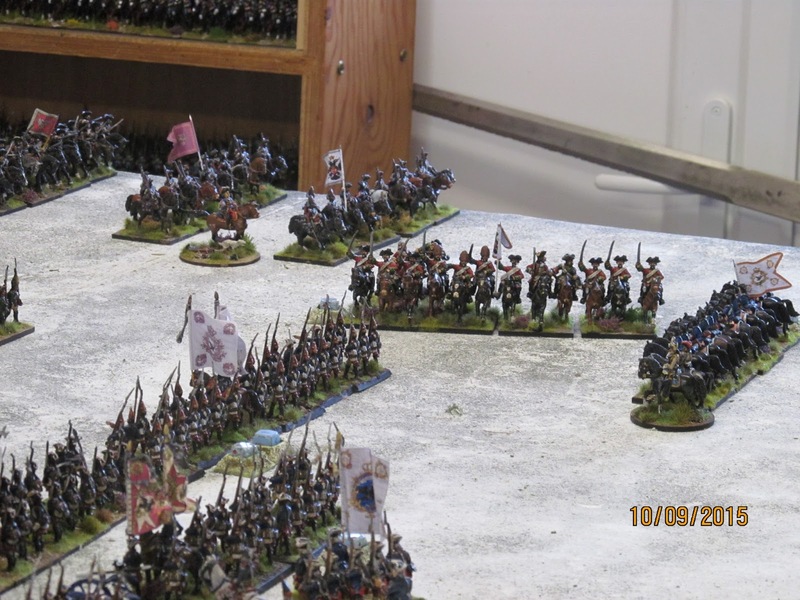 Meanwhile my second cavalry brigade on the right flank was broken when the attached hussar regiment charged a shaken and disordered unit of Austrian dragoons but failed to break them. The hussars were shaken so that tipped the entire brigade over the brink and they too were forced to retire, leaving my right flank exposed to lots and lots of Austrian cavalry. 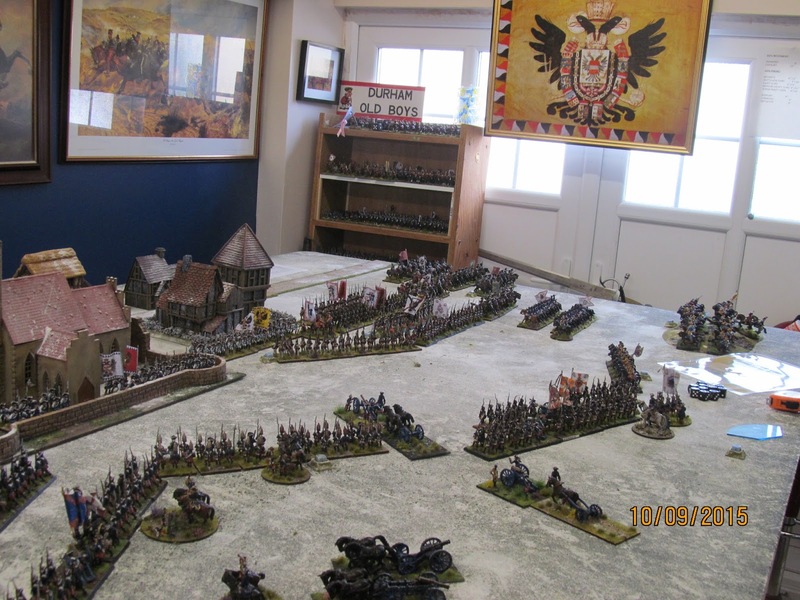 Indeed, the photo above shows the Austrian about to hit the flank of my disordered grenadier battalion, with predictable results. 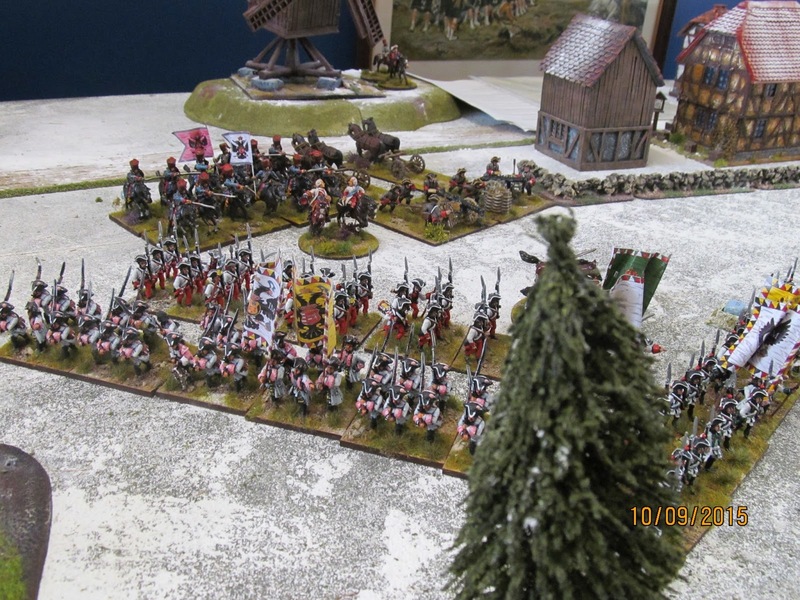 On the left, the Austrians deploy to hold their ground, wary of launching another attack against the massed Prussian artillery. 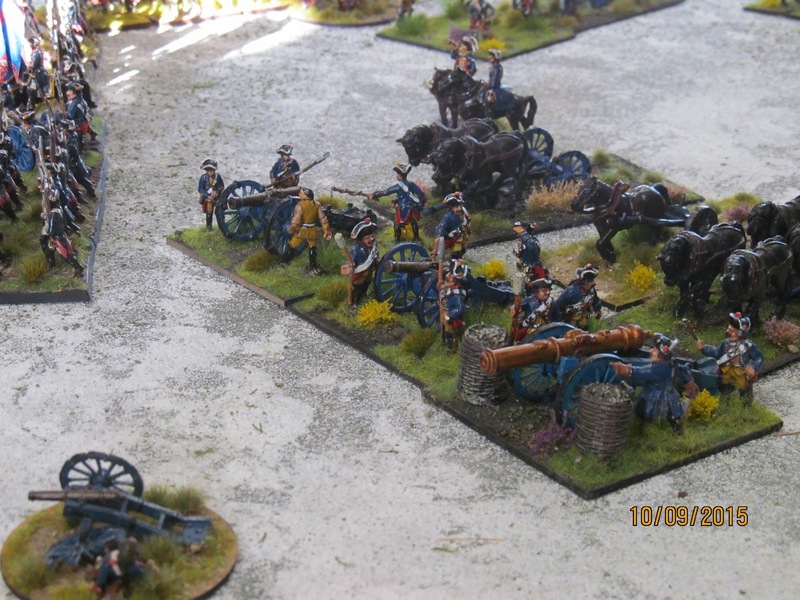 The Prussian main artillery battery - they did their fair share of damage to the Austrians. 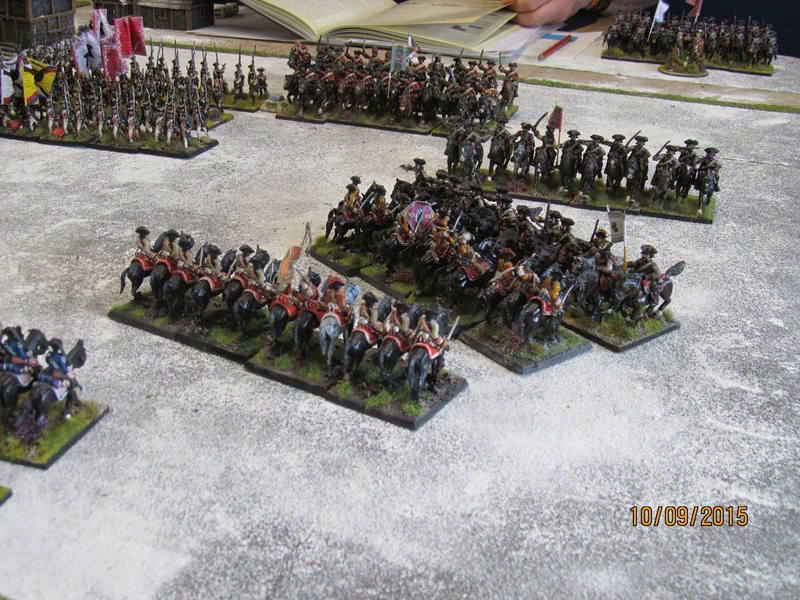 There are strangely no photos of the end of the game...... On my left, my cuirassiers and dragoons were unable to hold back the Austrian cavalry, despite driving off two units that were hit in column. My hussars were broken and the remainder of the cavalry were shaken and yet again a spent force. 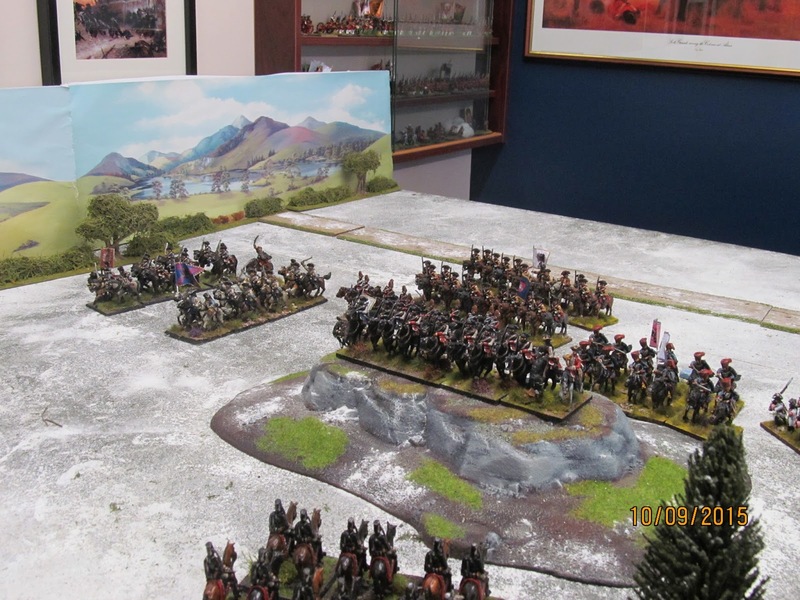 This meant that with all my cavalry out of the battle and both my flanks 'in the air' that the Prussians would be forced with retreating and I had suffered an ignominious defeat. That said, it was an enjoyable game and as always the result might have been very different if I'd thrown some decent dice and not wasted some of my cavalry on the right trying to hasten the retreat of the Reichsarmee brigade. Oh well, never mind. 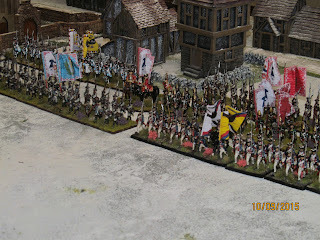 Next time its Zorndorf, which will be a fun little bloodbath no doubt! All you can conclude with is to say: 'a bad day at the office'. 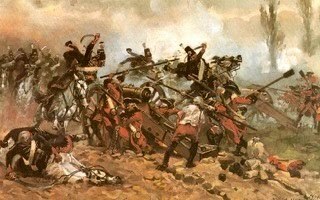 Maybe you should eliminate the brigade withdrawal rule for SYW battles since the armies really did not have a brigade organization on the battlefield. That would eliminate the situation where one or two units cause the whole "brigade" to retire from the field. Also, for Leuthen, you probably need a special game specific rule to allow more flexibility for the Prussian 12-pounders. Sorry to hear about the bad dice rolling, we have all been in your shoes before. Thanks Jim. The rule about 'brigade' break points is applied when more than half of a general's 'command ' are broken or become shaken. It is meant to reflect the combined effects of wear and tear, casualties, exhaustion, blown horses and seeing your supporting units run away or falter. 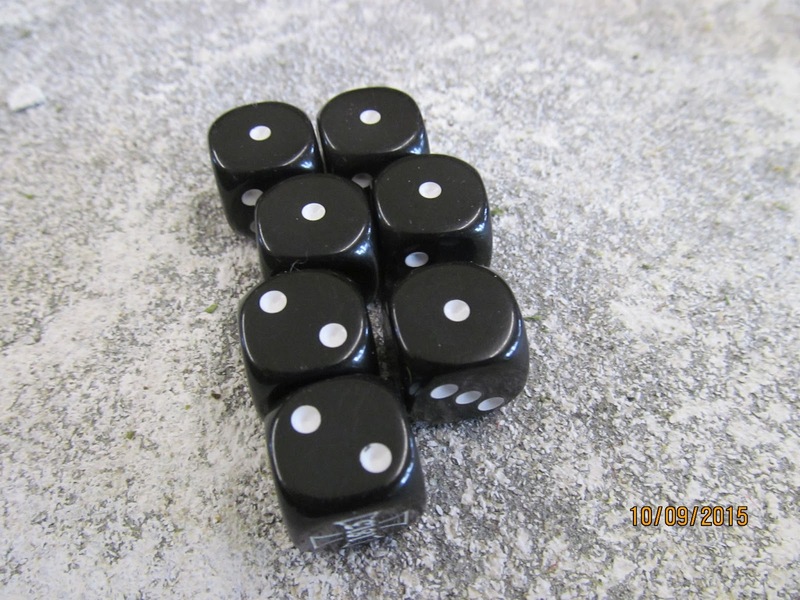 Never mind the bad dice rolling, what about the brilliant Austian/Reicharmee generalship. I too had some bad dice throwing, but the Austrians were clearly more up for the fight. No the orientation is correct if you check your maps etc. 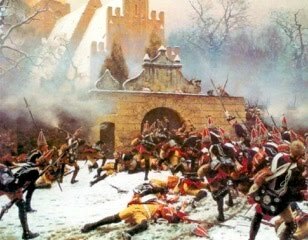 They are coming from the flank and the Austrians are rushing to face them, or in the case of the Reichsarmee, get out of the way.